World-famous conductor Herbert von Karajan's response, on being introduced to the delights of the compact disc in the early 1980s, was "All else is gaslight". It's a great one-liner, but was he right? Wasn't CD little more than a digital version of the vinyl LP anyway, with a laser replacing a stylus? If so, then Linn's Akurate DS system is far more radical. It takes the whole process of listening to music in the home to another level, replacing physical sources like CD or SACD with music stored on a hard drive, while offering remote access from the comfort of your armchair. Moreover, the resolution of source material – up to 24-bit/192kHz – is much higher than CD's 16-bit/44.1kHz. 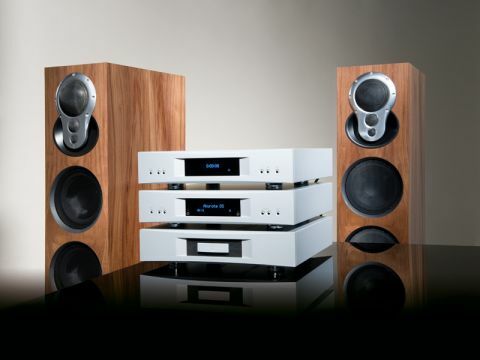 Akurate is Linn's midway offering, sitting between its entry-level Majik and flagship Klimax ranges. It's a versatile system that can be upgraded by adding extra power amplifiers -– or converted to full Aktiv operation with an electronic crossover. What's more, each of its impressive speaker units has its own dedicated power amp. "It takes the whole process of listening to music in the home to another level, replacing physical sources like CD with music stored on a hard drive." Outwardly, Linn's Akurate electronics look deceptively simple. The system comprises three boxes – the DS digital streaming device; Kontrol preamplifier and 2200 Power, 200-watt, two-channel power amp. Knobs and buttons have been kept to an absolute minimum, creating clean simple-looking fascia plates. But this outward simplicity is misleading. A fairly comprehensive range of features and facilities are offered – all accessed by remote handset. Now here's where the Akurate system starts to get interesting. You can control it from your computer, or via devices like an Apple iPad. The latter allows you to create playlists of favourite tracks without leaving your armchair. You can select/repeat/delete tracks as you listen, making the Akurate perfect for those who prefer to listen to a wide variety of hand-picked tracks (rather than specific albums) and like to flit from track to track. But the Akurate is also great for those who want to listen to long continuous works. If you had the stamina, you could play to an entire four-act opera – or even Wagner's complete Ring cycle – without having to leave your chair. Say goodbye to awkward breaks in continuous works that exceed CD's 80-minute playing time, pop-pickers. Listening intensively to a long work and having to get up and change discs, risks breaking the spell. And, there's no doubt that having long continuous playing times, enables you to get though a lot more music. The way an Akurate system is configured and the kind of remote access it offers, is something you'd discuss with your Linn dealer prior to purchase. But having the whole system controlled from an iPad is undoubtedly the coolest most flexible option, but it's not the only one. In addition to music downloaded from the internet and stored on a hard-drive, the Akurate DS gives you access to digital radio stations. You can also add a device that allows you to rip your existing CD collection to a hard-drive – and accessed that way, rather than playing the disc in a conventional CD player. Although it's perfectly possible to have a separate CD player with a system like this, it's likely you'd want to rip your CD collection to a hard drive so as to enjoy the benefits of remote access and (with long works spread over two or more CDs) no breaks between discs. The Akurate 242 loudspeakers also offer some interesting options. You can use them with a single set of cables – or up to five sets – either from a single amplifier, or five amplifiers. If that's not enough, they can be used in fully 'active' mode with electronic crossover and five power amps. All it takes is money! There's a further option to increase bass output/depth by means of an extra set of terminals for use with an additional power amp. This makes the Akurate 242 unusually versatile and upgradeable. The electronics have a very simple understated look. The casework is made from brushed aluminium and looks quietly classy. The finish is impressive without being the least bit ostentatious or flashy. Our review samples came in silver finish, but black is available, too. Each item is fairly light in weight. Some audiophile components are massively constructed, but not Linn Akurate components. While weight and high rigidity are beneficial, having relatively light casework also brings advantages. If resonance does occur, there's less stored energy with something light. Linn also claims that its casework improves sonic performance. The loudspeaker cabinets are beautifully finished and solidly braced for low resonance. There are two rear-facing ports and six-way binding posts allow active and multi-amp/multi cable operation. The piéce de rèsistance, though, is the assembly that holds the three high-frequency drivers. Dubbed The Array, this creates a wider dispersion at higher frequencies, giving better integration and less 'beaming' due to excessive directionality. Co-incidentally, it looks great and creates an attractive focal point. Sonically, the Akurate Electronics sound broadly similar to Linn's Majik. There's a comparable sort of openness and transparency; the same kind of crisp, lean, detailed presentation. It's not an especially warm or 'romantic' kind of sound, though neither is it cold or antiseptic. However, the Akurate seems a stage or two further on from the Majik. While recognisably cut from the same cloth, it seems noticeably more detailed and articulate, sounding even sharper and better focused. Individual voices and instruments are more separate, each one having more its own unique timbre and dynamic shading. Those looking for electronics that ooze 'personality' and add their own unique concoction of finger-lickin' herbs and spices may be disappointed by the Akurate. As the name implies, it's about accuracy and truthfulness, rather than sounding impressive or pleasant – though the Akurate can impress and please. The sonic gulf between hi-res music from downloads, compared to ripped stuff from conventional CDs, is very apparent – the improvement over the latter being more marked than we experienced with the Majik. Having such clean source material invites you to raise volume levels, so the Akurate's extra power comes in useful here. Initial listening took place with the Akurate electronics driving our Impulse H1/Klipsch Heresy III hybrid full-range horn speakers and results are impressive, albeit with a tonal balance tipped slightly towards the upper frequencies. Bass is good, but less voluminous than it is with our Musical Fidelity kW-750 combo. Changing over to the Akurate 242 loudspeakers underlines these qualities. They're very crisp immediate-sounding boxes that produce a sharp, articulate sort of presentation. Bass is quite deep, but it's the sort of bass that isn't there until it's there – and then (when it does come) it can surprise you with its power and weight. Of course, loudspeakers can produce vastly different results depending on the room they're used in. With this in mind, Linn provides a couple of foam bungs to block either (or both) ports to give a tighter, leaner bass. The high frequencies sound very airy and open, yet blisteringly detailed. The drive units are employed in special formation – called the Array – which creates a very integrated mid-band and treble, with wide/smooth dispersion. This acts in much the same way a reflector behaves when placed behind a light source. It makes the apparent width of the source wider, ensures a smoother more even frequency response and avoids the 'sweet spot' effect, thus enabling decent stereo to be enjoyed, even when sat well off axis. The Akurate 242s are reasonably efficient, so the amplifier's 200-watt output should be entirely adequate for most situations. However, if a bit more wellie is required, it's possible to add power amps (indeed, the Akurate power amp can be had in a three- or four channel versions) for multi-amp operation or fully active. People sometimes talk about a hi-fi system changing your life and buying a Linn Akurate may well prove to be a life-changing experience. Why? Because it enables you to access and enjoy music that simply isn't possible with conventional disc-sourced hi-fi systems. And while for many of us, fiddling about with LPs and CDs is all part of the fun, being able to select your music from an iPad and create a whole evening's uninterrupted listening, has its own special rewards. Rewards that you may never want to be without. Now – where did I put that shellac '78?